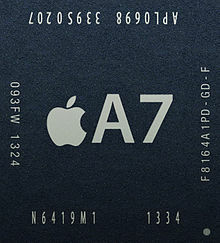 The Apple A7 is a 64-bit system on a chip designed by Apple Inc. It first appeared in the iPhone 5S, which was introduced on September 10, 2013. Apple states that it is up to twice as fast and has up to twice the graphics power compared to its predecessor, the Apple A6. While not the first 64-bit ARM CPU, it is the first to ship in a consumer smartphone or tablet computer. The Apple A7 is a 64-bit system on a chip (SoC) designed by Apple Inc. It first appeared in the iPhone 5S, which was introduced on September 10, 2013. Apple states that it is up to twice as fast and has up to twice the graphics power compared to its predecessor, the Apple A6. While not the first 64-bit ARM CPU, it is the first to ship in a consumer smartphone or tablet computer.